I do love a Real Techniques face brush, or three (or four…). For my money, there aren’t many brands that make better brushes for base products, and their blush brushes are magnificent! That said, I do not love their eye brushes at all – in fact, I’ve not met one of their eye brushes that I’ve used more than once before giving it up as a bad job, mainly down to their tendency to always be just that little bit too big and bendy for the job at hand, but that aside, Real Techniques are definitely hard to beat for a brush for practically any other purpose. 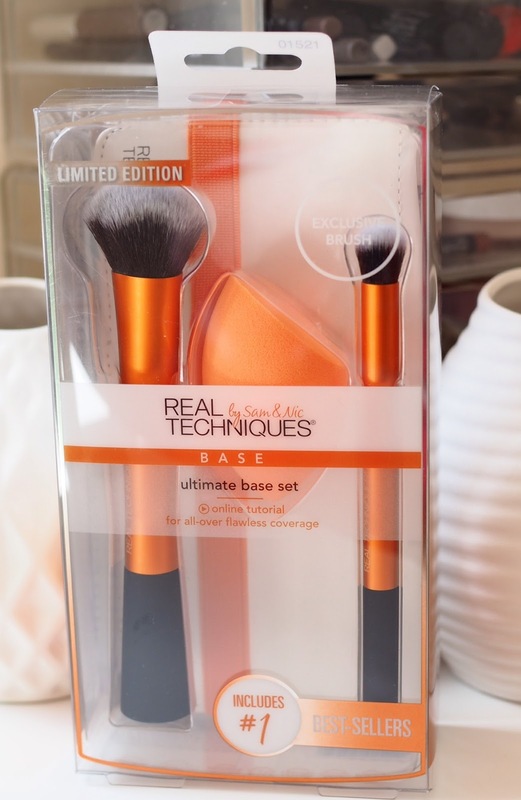 Their Ultimate Base Kit was therefore irresistible when the press release popped into my inbox recently. 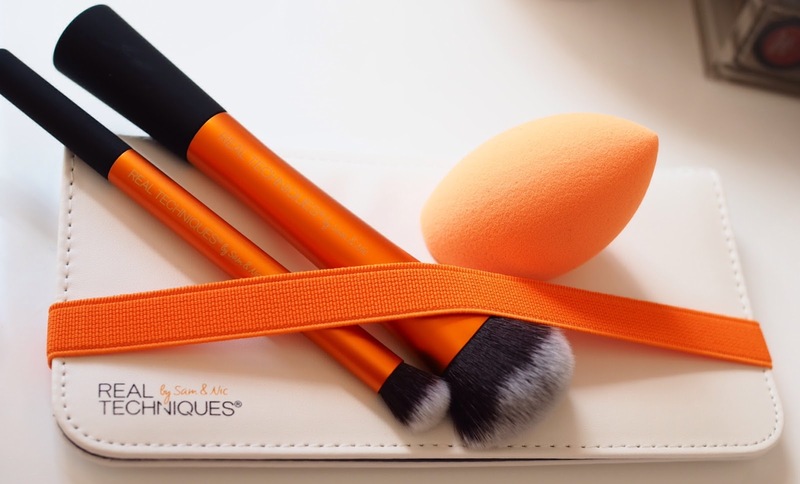 Just released as a limited edition, the Ultimate Base Set contains an Expert Face Brush, which is the domed brush on the left there, which is perfect for blending and buffing foundaitons and other base products. I have one from another kit, and it also makes a good blusher brush for any powder blushes you might have that are a little underpigmented. Next to that is the Miracle Complexion Sponge – does anyone else not quite get how you’re supposed to use these? I prefer to wear as little foundation as I can possibly get away with these days, and I only really seem to see people wearing inch-thick bases using these for blending purposes. Or do I not get it simply because I am just Really Old these days? And finally there is a brand new and exclusive Deluxe Concealer Brush. A bit wider than I would have expected for a concealer brush, this is actually great for buffing in under eye concealer, having nicely rounded bristles which are good for blending over larger areas (like around the nose) and being able to blend your concealer seamlessly into your foundation. Not quite so great for spot-concealing things like thread veins (or even spots, come to that) where you’ll need a brush that allows accuracy rather than diffusion. 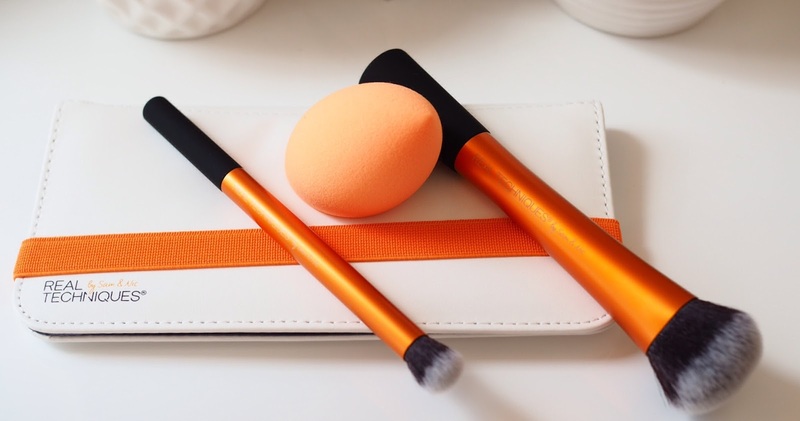 It comes packaged with a cute white mirrored wallet, which you’re meant to use to carry the kit around in, but it has two main problems; the first is that none of the elastic slots will allow the base of the Expert Base Brush through, and the second of which is how do you get a sponge into a flat wallet? That said, it is a cute wallet with a good-size mirror, and if you stick to your smaller Real Techniques brushes, it’ll be really handy for carrying those around with you. For £20.99 at Superdrug right now, the Real Techniques Ultimate Base Kit is worth buying mostly for just the two brushes, and I’d treat the sponge (unless you love base sponges more than I do!) and wallet as freebies.